Two Mile: Walter Johnson's Abby Green placed ninth in the Championship two mile, running an indoor personal-best 3200/2 mile time of 10:37.98 (converting to 10:34.28 in the 3200). Green enters the spring as Maryland's undisputed top distance runner, ending the indoor season comfortably atop both the 1600 and 3200 leaderboards. 4x200: The Bullis girls once again took their program to another level, becoming the first high school girls' team in U.S. history to run under 1:35 in the 4x200 relay. They already owned the record heading into indoor nationals, having run 1:35.39 at the Virginia Showcase back in January. The next big question for the Bulldogs is whether or not they can take down the outdoor 4x200 record of 1:33.43. 4x400: The Championship 4x400 was perhaps Maryland's best overall showing in any one event over the course of the entire weekend. The Bullis girls held off Franklin, who finished five seconds ahead of third place, while both Bullis' 'B' team and the Mount Hebron girls finished among the top eight teams. 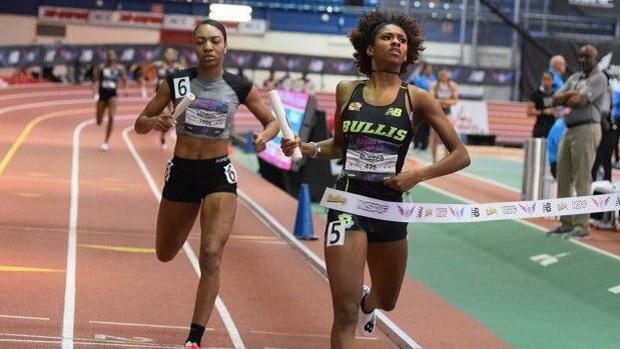 Bullis and Franklin are easily 1-2 on the national leaderboard for the 4x400 this season. 4xMile: The Northern girls made the trip up to New York as Maryland's lone representative in the Championship distance relays. Sarah Deresky, Claudia Dolan, Abby Sweeney and Alyssa Tatum all averaged around 5:20 per mile and placed tenth overall. 60: Bullis' Ashley Seymour qualified through both the prelims and semifinals to compete in the finals of the 60 meter dash, where she finished eighth. Her fastest time came in the semifinals when she dropped a 7.56, which is just a fraction of a second off her season-best 55 dash performance of 7.00 when converted. 60 Hurdles: Like her teammate, Bullis' Masai Russell finished eighth in the finals after advancing through the first two rounds. 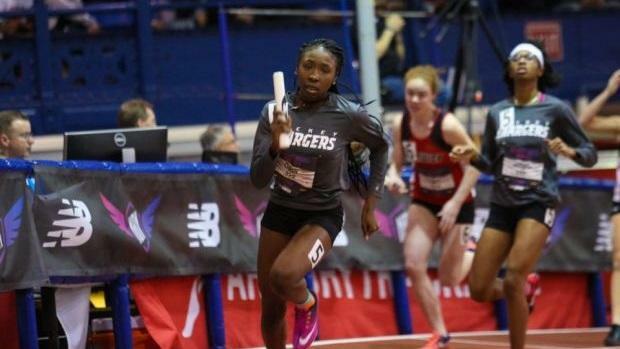 Like her teammate, Russell's fastest performance came in the prelims when she ran 8.40 (which converts to 7.83, just a hair faster than her 7.84 season best in the 55 hurdles and likely an all-time Maryland best). 800: Franklin's Nyjari McNeil won her heat of the Championship 800 and finished tenth overall. Her 2:11.80 performance is the fastest she has ever run indoors, and the third-fastest when factoring in outdoor performances. It's also fourth in MileSplit MD's database dating back to 2000 and a top-15 performance in the country this winter. Long Jump: McDonogh junior Jada Seaman leaped to a huge personal best in the long jump, soaring 19 feet and 6 inches on her first attempt - good enough to place fifth overall. It's the top mark in Maryland this season and the fourth-best in the state since 2000 according to MileSplit MD's database. SMR: Behind a 2:13 anchor leg the Bullis girls finished third in the 1600 meter sprint medley relay. Their 4:04.37 effort has only been bested in recent years by Eleanor Roosevelt (2009) and McDonogh (2014). It also gave the Bulldogs a top-three finish in each of the three sprint relays, showcasing the depth of the team. Triple Jump: Ever since she broke the 39-foot barrier last winter, Bullis' Cierra Pyles has been chasing the magical mark of 40. She came up just short at nationals this weekend, placing eighth with a personal-best leap of 39'11.25 (which she achieved on her final jump). The effort vaulted her past McNamara's Taylor Grimes into the top spot on the state leaderboard for the indoor season. 200: Bullis juniors Sierra Leonard (3rd, 24.51) and Lauryn Harris (4th, 24.57) placed highly in the Emerging Elite 200 finals. Both performances were personal bests and the fifth- and sixth-fastest times in the state this season (behind four other Bullis teammates). 400: Six Maryland girls competed in the Emerging Elite 400 meter dash, but Friendly senior Antoniette Bradley was the only one to crack the top ten. Her final time of 57.17 was a personal best and eighth-fastest in Maryland this winter. 4x200: The Emerging Elite 4x200 saw two state champions from Maryland go head-to-head, with the 3A winners from James H. Blake placing fourth and the 1A winners from Henry E. Lackey finishing in fifth. It was a season-best effort from Lackey which bumped them up to fourth place on the indoor state leaderboards, right behind Blake. 4x400: A fourth-place finish in the 4x200 relay apparently wasn't enough for the Blake Bengals, who won the Emerging Eliet 4x400 relay by over four seconds. Interestingly, it was only the third-fastest performance of the meet by a 3A Maryland school, as Franklin and Mount Hebron ran faster in the Championship section. Could we see three schools blow past the 3:50 mark in one race at the outdoor state meet in May? 4x800: The 4A state champions from South River placed fifth in the 4x800 relay this past weekend, getting four legs between 2:19 and 2:25. Overall they had three separate performances this winter faster than any other public school could match. 60: Franklin's Tylar Colbert ran 7.64 (converts to a 7.12) in the prelims of the Emerging Elite 60 meter dash, and then came back to place sixth in the finals with a nearly identical time of 7.67. When allowing for the 60-meter conversion, that ties her for the sixth-fastest performance in the state this season. 60 Hurdles: Bullis' Leah Phillips turned in a spectacular performance in the finals, breaking the Emerging Elite meet record - you can read more about it here. Her teammate Cierra Pyles finished beside her in fourth place. High Jump: Wheaton sophomore Madison Depry cleared 5'7 and only finished in third place on the tiebreaker. 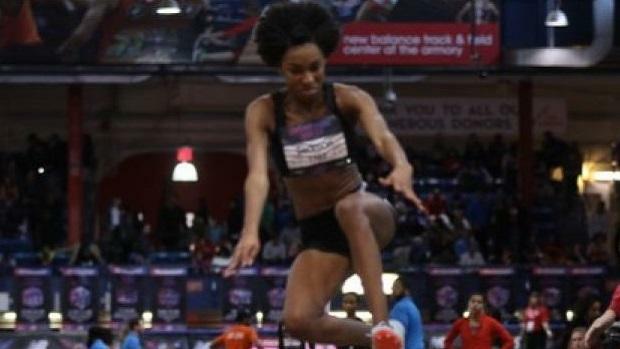 It was yet another breakthrough in what has been a breakout season in the high jump for Depry, and is the second-best performance by any Maryland girl this indoor season. Both Brunswick's Rosie Cicmanec and Linganore's Kathleen Gallagher cleared 5'5 in the event, as well. Long Jump: Bullis' Aniella Delafosse added five inches to her long jump personal best, and her 18'5.75 effort was good enough for fourth place in the Emerging Elite competition. Only Jada Seaman and Delafosse's teammate Cierra Pyles jumped farther this winter. Shot Put: Lackey's Courtney Hawkins continued her run of excellence this season with a fourth-place, MD #1 throw of 42'0.75 this past weekend. Nationals and the Virginia Showcase are the only meets in which she's lost a shot put competition. Frederick's Paige Tolbard cleared 40 feet and finished tenth.